Oh wow are we excited. We have been working on this for months… and months… and months. Today, Majestic SEO are really proud to announce two new and significantly improved evaluation metrics, based on link data. For the first time, we are now able to use an iterative process – flowing through our link map – to give you easy to understand numbers (between 0-100) on how effective a URL is based on the flow of a characteristic through the web. When we looked at the page and domain metrics in the industry today, we found PageRank faltering (and trademarked) and that really left the industry leader as MozRank. SEOMoz and MajesticSEO have a friendly rivalry – we push each other to do better. We therefore encourage you to compare our metrics with theirs. We think we just raised the bar. Today we are launching two metrics – Trust Flow and Citation Flow. These form the initial pillars of our new flow metrics algorithm and can be applied to any URL, any sub domain or root domain. Together they give you new information about links and when you map all the Trust Flow and Citation Flow to a website, you also get a really cool chart showing the site’s link profile graphically! I’ll tell you a bit more about how the Flow Metrics work in a bit – but let’s have a look at the charts. Every link to a site has a Trust Flow value and a Citation Flow value between 0 and 100. So every link nearly fits on a 100 X 100 grid. 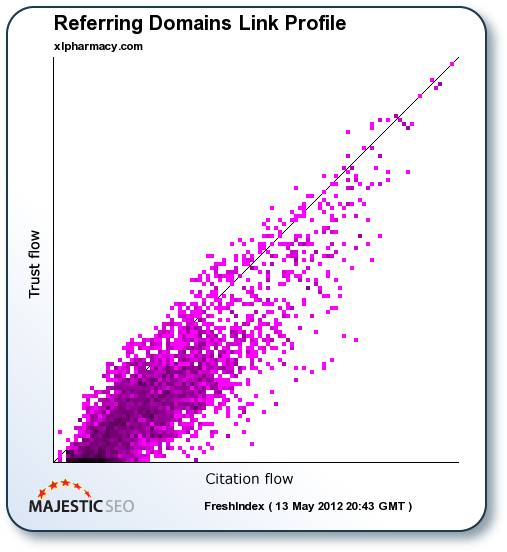 Links with high Citation Flow end up more to the right… links with more Trust Flow end up higher on the chart. Of course, many links could have the same scoring, so the density and colour of the chart helps to visualize these. Here we are comparing two sites with quite respectable link profiles – Search Engine Watch vs Search Engine Land. Almost every link flow chart that you generate for a domain will tend to have this elliptical nature and we expect SEOs will debate for months to come on what each chart means, but from our perspective, the area where the colours get dense look to be highly significant . Visually – these link graphs seem very appealing. So is this a trick of the stats? No – there are now many iterative algorithm calculations going on now during each index update, so that if a URL has a high Citation Flow or Trust Flow score, then proportionally more of that value will “flow” through to the links from that URL. Doing this once is cool. Iterating this loads of times is incredibly difficult – but we have cracked it and now we are able to give this to you instantly in all your reporting tools. To help visualise how Flow Metrics work, imagine a wave coming up onto a shore full of rock pools. You want to predict which rock pools are likely to have water in them. The wave comes crashing over the rocks and we know that the first pools will fill up. When they fill up, they spill out into neighbouring rock pools. Water can flow from several pools to fill up a rock pool a long way from the shore line… but eventually the water will dry up. If your rock is still dry… it’s not in the right place. Graphically we can see what happens, by charting two Flow Metrics. Like fingerprints, we see the data come alive. Let’s look at a respected site like the BBC and then at a less dominant site like XL Pharmacy. The lower quality site not only has LESS links, but the areas where the colour is darkest seems to be much lower on the TRUST axis and much closer to the origin. We seem to see this pattern over and over again and by the end of this post we expect many of you to stop what you are doing and start looking at these patterns for your own sites as well. What is the difference between Citation Flow and Trust Flow? These two metrics have intrinsic differences, which is why the charts are not symmetrical. This flows our old metric – ACRank – making it much more accurate at predicting how influential a URL might be based on how many sites link to it. Because links are now not all created with equal weight – and because a strong link will have a relatively stronger influence on URLs further down the chain, you can see how much better Citation Flow is as a mathematical logic than the old metric of ACRank. We start with a large list on manually reviewed URLs. These have a crowd-sourced level of trust but by no means include all the trusted sites on the web. It turns out, though, that trustworthy sites tend to link to trustworthy neighbours. Those neighbours also tend to link to trustworthy neighbours themselves. In fact – after lots of iterations – those outside the circle of trust are put in the cold. So Trust Flow, like Citation Flow passes THROUGH urls like sound passes through walls – with awesome effects. In our tests, we see that most link profiles have better Citation Flow than Trust Flow – so if you see any sites with better Trust than Citation, we’d be interested in knowing about them as I am sure there will be more than one SEO starting to analyze these statistics. Bet you thought we didn’t care about internal links? Well although we don’t report on them, flow metrics do pass through internal links. This means a strong home page can influence the metrics of pages within its own site – although strong external links to inner pages will significantly boost a Flow Metric. We crawl the whole web. We’ll make our own decisions about what is and what isn’t “trustworthy” from now on. We think our way is better anyway. Every time our index updates, so do the Flow Metrics. For the Fresh Index, that means daily! So how can you start using these new metrics? * Our bulk back-link checker tool – where we encourage you to compare en masse against anyone else’s metric. * Our standard reports – so you can drill right down to the detail. We hope you get as excited as we are and invite you to start analyzing our new Flow Metrics, comparing websites, comparing our metrics with the competition and giving us feedback. Please tread gently on our dreams, though. You would not believe the sleepless nights that Alex and Steve put into this work. As of today we will be making the system live with the Fresh Index. We hope you like it! Like seriously, guys, that’s freaking unreal! I’m mighty impressed, I think it’ll take a little while for everybody to get their head round it though. Awesome stuff. I think the new trust level metric is great, something that just the old ACRank alone was missing. We will have fun digging into these. 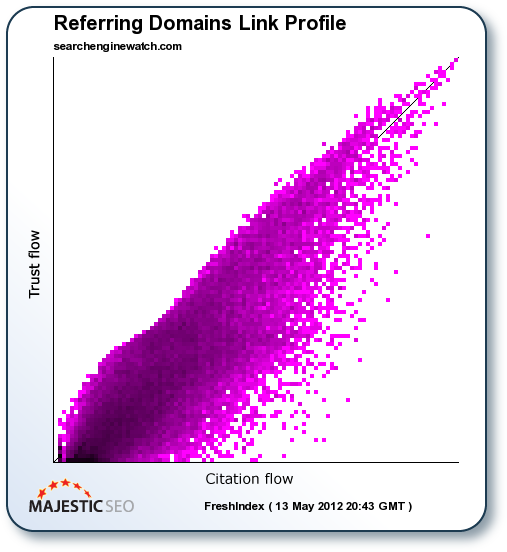 * The ability to change the axis to consider just trust flow or just citation flow (ACRank) against referring domains. So it would be cool to just be able to look at the number of referring domains against trust flow/citation flow for example. Sometimes easier to visualise (will have to do in Excel for now :-). * Link profile fight to consider root level metrics. At the moment it seems to just be page level. (In site explorer you can choose both?). Congratulations to you and the team, the hard work looks like it has really paid off! With regards to a URL level link profile fight – the tool should switch automatically to URL mode if you specify “http://” before the rest of the URL in either of the two inputs – ie, URLs need to be expressed in long hand. Great tool Dixon…I’ll gonna try and test it. I think the trust level metric is great. If it isn’t already, then making the y-axis logarithmic (the trust scale) might help tease out more information from the chart visually. Ah! You’ll be wanting to dig in using the reports to see all the dark area detail. You are right that this is where the real juicy stuff is, I think. Really looking forward to giving the new metrics and visuals a test drive. I think an animated “change over time” would be great for this particular data visualization. I’m assuming this would be doable with the data you store? Thanks! We are going to listen to the feedback a bit now – then work on the best ideas. I’ve been longing for a Majestic feature like this for a long time. I agree – you’ve just raised the bar!! A new tool. Very good! Great analogy with the waves, I’m excited to test this new tool out! If it works out, it’ll be a nice way to show clients just how important link QUALITY is. Can anyone come up with any others? If i understand this even majesticseo.com is not doing well. Can’t be just a simple score number will do the job? Well I have to say I Like it! Makes for interesting reading thats for sure, our Site (Ford Dealer in the UK) www.jennings-ford.co.uk came out with cf=44 and tf=45 however I am still a little unsure as to what a Good score would be. The Dark area is definately more in the Citation area over the Trust area. So just to clarify what this is saying, should we now be looking for sites that are darker closer to the trust area to try and get them to link to us? Im unclear as to what the definition of Trust is as well. Because there is so much data here, saying what you exactly need to look for is going to tae a bit of getting used to and analysis. I did an analysis of correlating Citation Rank with Page Rank, for example and the correlation was astounding. From what I am seeing, the dark patches feel good – but actually going into the reports and seeing the links by Trust flow and by Citation flow is where the real analysis needs to go next. We are providing the data/information for the SEO world. The SEO World now needs to work out how to interpret this. Different sites/urls will reveal different things. A blanket strategy is still a bit away. Great job guys. Those are the best news that I have received lately. I hope you will continue to improve Majestic. I’d like to be able to see Flow Rank and Citation Rank Numbers for the page being looked at, above Flow Rank and Citation Rank Numbers for the root domain. An example of this is looking at a wikipedia page. The page itself can have very low backlink numbers, very low flow rank, and very low citation rank. But because the root domain has enormously high numbers of all three metrics, the page ranks high in Google SERPs. Being able to see root domain numbers and page numbers on the same page in majestic would be incredible. Wow 😉 Dixon, it looks nice. this is really cool. i’m even sad, that i didn’t do it myself. you can send me email if you want more. I’m also interested in helping in your tests. I hope the Hollywood guys who produced “Meet the Fockers” don’t get snippy and growl over you’re using “Circle of Trust”. It would be interesting to see a 3rd color touch point that highlights a dual high-Trust and high-Citation flow • or if that’s even on your radar? Like it! awesome feature and you definitely gave a monstrous index. Great work! So far I love this very quickly seeing if a site is worthy of pursuing for a link or not! Also, guys the chart is clickable and will open in the tab titled “Link Profile” in case you missed it the first time around. I did. Question for Majestic: On this Link Profile page is a selector that lets you view the chart for either the individual links or the referring domain stats. Is “external backlinks” ONLY looking at the flow metric that each linking URL has, whereas the “referring domains” looks ONLY at the flow metric of each individual domain that’s linking in? If that’s the case, then it’s obvious that the chart for external backlinks is so much smaller than for domains, because most backlinks to a site don’t come from the homepage (that’s the simple explanation), and most pages that link to a site will only have a small percentage of trust and citation flow compared to the whole domain. Bravo for this new tool!!! Actually – there are less nodes in the “referring Domain” representations, than External Links representation, because any referring domain always has one or more link pointing to your site. HOWEVER, the charts appear like there is less links, because a URL tends to have a lower TF and CF than a domain, so at the URL level the dots get bounced more to the bottom left and get DARKER as a result, indicating more links with those characteristics. At least – that’s how I am seeing the data at the moment. Love it! This is going to save us so much time while giving a lot more insight into url trust metrics. Nice work lads, very, very impressed. This is the sort of insight that makes my job much easier! The Better Business Bureau business reviews would all score very high on Trust Rank and Citation factors I am guessing!! Ok..now I have two more numbers I don’t understand. Can you make it easier? If I’m 4 by 4 what does this mean? Is it good? Or do I go out and buy a new truck. Maybe you can hire a fifth graders and write the definitions…Maybe you should change it to words..for example a 2×2 means..your screwed, nobody cares about your piddlyass web site.. 10×10 means. …wow someones been busy writing blogs your moving up…and. 99×99 …you must be the God.com website……. >>Can you make it easier<< I suppose you can just go to Google and take the order the results appear... call the top result number 1, second result number 2, third result number 3 and then Bob's your uncle? 🙂 We provide the building blocks for SEOs. Interpreting the data... I am afraid that is what you'll need to work on. There is nothing very simple about seeing the relationship between hundreds of biliions of anything, let alone urls. Two numbers between 0 and 100 is a pretty good attempt we feel - but you are welcome to take one number... Citation Flow correlates very well with Page Rank as it happens. Will that do you? > Oh that would make a great video 🙂 To show an example of 2 sets of top 3 sites for different KWs perhaps. I appreciate this kind of comparison would probably to come with a ‘*disclaimer* but think it would help to show that… either way, great work chaps. pepsi.com apparently has trust flow more than that of citation flow. Good job Alex and Steve and thank you Dixon.. Thanks Divi. Now we asked for them, we are getting these examples coming out of the woodwork. I hope people don’t mind, but I will suppress these links from here on in. Looks interesting, but I’m still not totally understanding what the two metrics say. I like the rock pool analogy for link flow in general, but you never really connected it to the metrics. Is trust flow how links flow through only the trusted sites and citation flow how the links flow through all sites? Trust Flow starts from a set of trusted URLs but after that it flows through web graph (apart from links marked as nofollow). This is how Trust Flow can reach even pretty remote sites but the further they are away the less of flow they’ll get. Big difference between Citation and Trust can indicate some kind of problem with the link profile – charts are a good way to visually see if that’s the case. If we have to check quality of backlink, Trust flow is the right thing to depend on? Cool, when will the metrics become available via the API? Krytle – it is already there. Please set up a suppor ticket. This one might be interesting as it is a blog that is only 2 months old. Trust is higher than citation, with very few referring domains yet. Maybe lack of data will help you see how the trust>citiation pattern begins. Dailymail is one of the sites which has better Trust Flow than Citation Flow. Just one question – How much you think Trust Flow differs from Moz Trust? cf correlates better with Page Rank than anything else out there. Our correlations with “quality” (however you define that) feel intuitively correct, both at the domain and the URL level. Does the fresh index still update daily? or is it from an archive weekly/monthly build. I was literally just weighing up the pros and cons of dumping MajesticSEO and using Moz instead, purely because AC rank is of no real value and the Moz metrics can be quite useful. This is pure VALUE! Thanks to everyone at Majestic!! I get that the domain flow is = to the trust & citation of the root domain. However, what is the url flow metric measuring? Let say a website with cf=33 and tf=26 , is this good? Also which is better cf > tf or tf > cf ? How can we order a report’s backlinks in order of trust/citation flow? I can see “Top pages/links (sorted by ACRank)” – but that is the old metric. At the moment I think the default order is a sum of tf and cf. We have other sort options on the list, but working on Csv files first which are what people seem to want most. Great Work, congrats ! This is really usefull ! Very interesting data – a lot of exploring to do. This is a really interesting development, although I am still trying to get my head around it, to understand it better. > I had to read it twice… but think I have got it down (in my comment further down). Thanks guys. I had been seeing this on your site for a few days but there was not an explanation for it. Now I know….pretty ingenious. Well done guys! One great reporting option that would leverage this data would allow us to set a threshold of citation & trust and allow us to export the links above or below the threshold to csv. Not only would this allow closer diagnostics of a specific cross-section based on these awesome metrics but it would us to create our own researched lists of high quality sites for our link building databases (based on our own preferred thresholds). This would be a valuable report to access quickly vs manually creating it with the data you provide (time is money!). Keep up the great work guys! That is a bar raiser! great tools you provide. I am not really sure, if i understand correctly your citation flow. Can you give the exact definition or provide a link, where i can read it? I mean how you are calculating it? 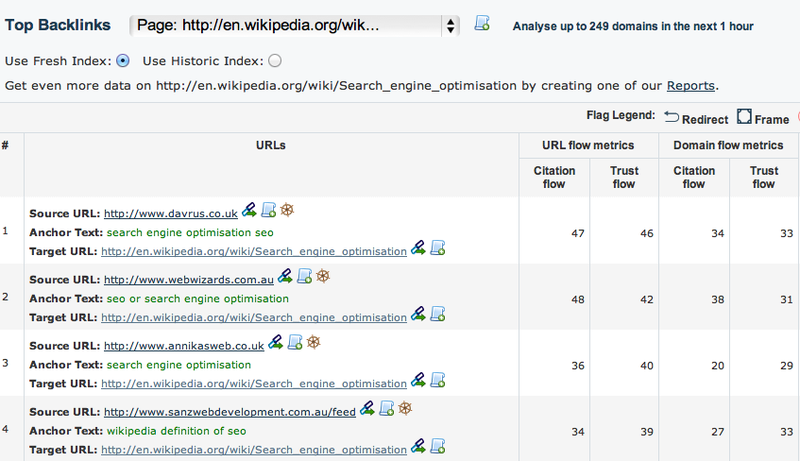 If i understand correctly it is not more than ACRank of links visualize in a flow. In any case the first try i do with a site for which i am working compare to my competition site in link fight, confirms that the Onpage must be improve by our team, because the competition are outperfoming us, but we have some more points in trust flow in the y-axis to the top and some more points in the citations in h-axis to the right, but they have more points near the 0, indicating my observations of many spammy and paid links. Because of the new penguin update i am waiting for the breakdown of them. That’s a hard comment to understand, interpret and respond to – I think we probably need a German speaking blogger to help us out… Any takers out there want to become our German ambassador? i mix up a question with a comment. I want to ask you, if you can give the definition or provide a link, what you mean by Citation Flow? As ambassador in Germany, i can get a free upgrade of my free aacount? Been blown away by this tool. Left some observations on Search Engine Land. If you check out Coke vs Pepsi results, A great example to show the masses, to explain your tool. Seriously a versus tool – To identify competitive gaps is an awesome idea. To find opportunities. or similarities. To tap different markets. -What about a “Follow vs No Follow” (Filter) so we can actually differentiate ADS to SPAM. Since a reputable advertiser will follow the rules. This would help immensely to tell a story. That’s one for the bucket list, but you can always use the report filtering options to get these in a Csv. Awesome! Was waiting and waiting for the AC Rank to get updated. Was NOT expecting something like this. You definitely raised that bar on this one. LOVE that you can get url/page metrics too! Awesome work guys, youve certainly raised the bar with this one. You asked for examples of sites that have higher Trust vs. Citation flow, well here you go: www.ancestry.co.uk. Looking at our UK TLD we’ve got a 61TF vs. 54CF. Oddly our US site, which has significantly more history, mirrors your expectations e.g. 73TF and 83CF. However, if you change the view for the US site to a page-level Summary, we’ve got a 71TF and 67CF. Does TF assign higher value to different TLD extention e.g. .org or .gov? Not especially – but a .gov MIGHT be more trustwororthy due to the people that link to it. Wow, That looks cool. I think it will really help get a much better picture of what type of links you have. I think it will take me a while to get my head around it as I was used to the olf graph pretty much. Pretty impressive stuff – off to check this out. Hi guys, I had to read through this twice to fully grasp it, the rock pool analogy and screen shots were useful! So my understanding is essentially, your Trust flow will be high if the sites linking to you have lots of trust worthy neighbours linking with good quality to them? And your Trustflow could be low if you get links coming from sites with less of a chain of linked sites coming to them?! Also, simply put.. it seems to me that the more heavy and fuller the diagonal line extends to the top right for you, the better!! p.s. A video explanation would be cool! Hats off guys – this is one hell of an update. Look forward to digging into these new data sets. Great post! Reallly usefull! Trustfactors for links and internal links! I’m a bit confused about your nofollow use, considering Google, they still take nofollow links into some account, does your algo just completely ignore them? At the moment we treat nofollow links exactly what they were designed for – flow won’t pass through those. Looks and sounds like a great addition to Majesticseo. I believe the trust factor metrics is an incredible idea as we all know Google is placing a whole lot of emphasis on the trust worthiness of sites. I’m heading over to majestic right now to play around with this. Way to step up Majestic. Great to have another alternative to page rank from a trusted source. Nice that it’s available in the API right away as well! Not something we would build – but maybe the Chrome guys might ask us for an API. Well done. Good timing as well. A visual authority link metric was much needed. Dang, I think I might have to hop on board. Gotta have this info since not having it is like being blind. What about the position of the link on the page (footer, sidebar etc.) and it’s context? Do the new metrics take that into account as well? Not at the moment, but we’ll see what we can do in the future about it. Hi guys, great work. Very usefull stuff. But I´m having trouble understanding the trust flow. I understand what it stands for but when I´m looking at links that with ongoing Panda and Penguin over time should be valued less, in my opionoen, they still seem to get high trust flow. Could you please explain more fully your thougts on trustflow. This backlink for an example even gets a higer trustflow than citation flow. We can’t explain all that Google does, I don’t think anybody outside of close circle of people who actually programmed it know for certain what their new algorithms do, however we believe our new link profile charts that visually show difference between citation and trust can help spot unusual link patterns, particularly case of high citation / low trust scenarios. I don’t want to focus on individual examples – but a trustworthy page is not always a pretty page. If a trustworthy page is full of links, the page may have trust – but each site getting a link on the page… Much less trust flowing per site there. A list of project members in a specialized project might fit that world. Sure is a pretty way to present the data. Looks as though “trust” is harder to build than citations. I think I understand now. My rock is pretty dry and I have nearly soundproof walls. Congrats Majesticseo team, those new values & graphs are the tool many of us were expecting, because of the out-of-date feeling of the old data (not only you, but seomoz’s and everybody else). This definately makes sense and helps a lot with the trust/spammy link profiling work which was getting harder and uncorrelated with google results, imo. This is the sort of insight that makes my job much easier! Is there a way to put in a list of multiple URL’s like in the bulk back links section where you can see the trust and flow. Right now it appears you have to do them one at a time. This would be very useful for prioritizing a list of domains to pursue for a link exchange. Bulk link checker should show Trust/Citation flows for URLs and domains, not sure where you are trying to check them one by one? Please drop us a support query if you have further questions. I have a question for you. Last month, I watched two regular parameters – Citation Flow was 20, Trust Flow – 15. My site was n12 in google with high kompetiona keyword. Now the situation is as follows Citation Flow 38, Trust Flow 29, but my site was down to 238. How do you explain that? There are other factors that determine position of a site for a particular query, it’s a good idea to check our Anchor Text tab that now shows Citation/Trust Flow of referring links for particular anchor text, this will give indication of strength for particular query rather than overall for a URL. I can’t answer that here. Our metrics do NOT try to measure a page’s ranking on Google. Citation Flow is a measure of you link equity and Trust Flow is a measure of the trustworthiness of the URL in the eyes of other sites. Neither one tries to address why you might rank directly on Google. Over the month, Panda had a big update and Google made a change to penalize Exact match domains. Google is starting to heavily address the issue of having over optimized sites. We provide you with a unique view of your data, from a link perspective, but do not provide consulting services directly. I just want to say that you guys have always been leading in having better data and you’re only getting better every day. 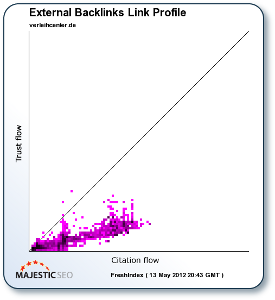 The amount of links I can see in Majestic compared to some other backlink checkers is amazing. The area you were behind in was the user interface, but now you guys are catching up on that too. The anchor text tab is a big help and something that was definitely needed. Being able to break down the trust and citation flow of different links and anchor texts is absolutely amazing. Keep up the good work guys. You have better data than other services. 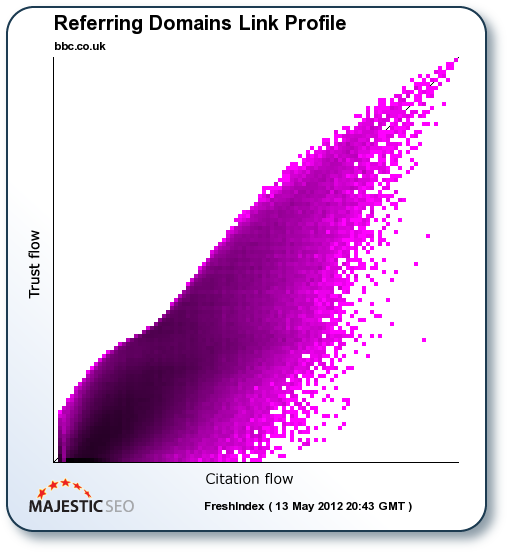 I have to say, that: thanks to MajesticSeo i started to understand link/anchors/google mechanism. I hope you will continue to improve Majestic. Thank you for the great article. Was there a tutorial available for this? Been online since June but don’t seem to be getting anywhere! My trust flow and citation flow have remained pretty low. I would start there. Please do not use the comment area for support questions. Majestic is not a consultancy or and SEO Agency, so does not answer these questions as a rule. I hope this was helpful. May I also suggest Google’s webmaster tools help forums as a free alternative to professional SEO advice. I’m learning more and more about Majestic SEO and come about this article to see that my website has trust flow is actually higher than citation flaw. Despite that it really suffered after latest Google algorithm changes. It dropped from first page on Google far back. I think it was over optimize on certain key words. Links are only one signal in Google’s algorithm. Certainly on page issues and crawler issues affect rankings, as does location, personalisation, query type, competition and several hundred other factors. I need more help in using the tool. Where can I start? Love the information. Any ideas how to increase the trust flow of my website? Thanks! If you get dofollow links from pages that have high Trust Flow then you should see the increase, as long as our crawler can fetch them! > thanks Alex and working Christmas day impressive. cool, really helpful to analyse the value of several domains!